Making Sense of MS: Ben Turner, Consultant neurologist, Rachel Morrison, MS Specialist Nurse, and Simon Ghafur, MS Nurse Practitioner, explain the different types of MS; relapsing remitting, primary progressive and secondary progressive. Not everyone's MS is the same. You might have a diagnosis of relapsing remitting MS, secondary progressive MS or primary progressive MS, but everyone has a different experience. Although MS can be divided into three main types, it's not an exact science so sometimes there's some doubt, especially to begin with. Your neurologist may have told you which type of MS you have. If not, you can ask them, or your MS nurse at your next appointment, although they may not know yet. Keeping a diary with brief notes on any new or changing symptoms can help your neurologist better understand your condition. 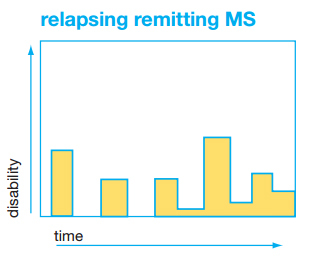 The majority of people with MS (around 85%) are diagnosed with the relapsing remitting form. This means that they will have periods when symptoms flare up aggressively - known as a relapse, an attack or an exacerbation - followed by periods of good or complete recovery - a remission. Relapses are episodes of new or worsening symptoms lasting at least 24 hours, but usually anything from a few days to a number of weeks or months. Some relapses are relatively mild, but some are more severe. Symptoms usually improve and may go away completely as the body repairs itself. Relapses may be treated with steroids in the first few days to speed up recovery. Every relapse is different and it isn't possible to predict when relapses will happen or how often. The frequency of relapses, the severity of symptoms experienced and the length of the gap between attacks are unpredictable. Similarly, it may sometimes be difficult to determine what is a fluctuation in symptoms (a day to day worsening or improvement) and what is a relapse. On average, people with relapsing remitting MS have one or two attacks a year. Although recovery from relapses may become less complete, the level of disability will remain largely stable between relapses. If you have relapses, talk to your neurologist or MS nurse about taking disease modifying drugs (DMDs) as these can decrease the number and impact of relapses. The term rapidly evolving severe relapsing remitting MS (RES) is used in relation to the drugs natalizumab (Tysabri) and fingolimod (Gilenya). This is a less common form of relapsing remitting MS in which someone has two or more disabling relapses in one year and evidence of increasing lesions on two consecutive MRI scans. The term benign MS is sometimes used to describe a version of relapsing remitting MS with very mild attacks separated by long periods with no symptoms. The phrase is sometimes used inaccurately to describe a period with few or no symptoms following diagnosis. However, as the defining characteristic of benign MS is the long-term absence of symptoms, it can only be diagnosed retrospectively after ten or more years. It is estimated that about 15-20% of people with MS have this experience of the condition. The term is not recommended as it can only describe an individual's past experience of MS, and not the likelihood of a future relapse. Read more on relapsing remitting MS in our A to Z of MS. Many people who are initially diagnosed with relapsing remitting MS find that, over time, their MS changes. They have fewer or no relapses but their disability increases. As this follows an initial (primary) relapsing remitting phase, this is known as secondary progressive MS. Some people are already experiencing secondary progressive MS when they receive their diagnosis as the relapsing remitting stage went undiagnosed. 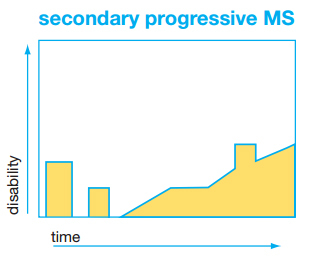 People's experience of secondary progressive MS can vary widely. Some people find that the increase or progression of disability is very gradual, whilst for others it can occur more quickly. 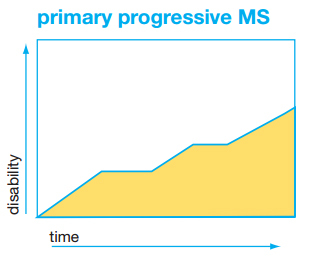 Studies that have monitored people with MS over a long period of time suggest that after 19 years, half those people who were diagnosed with relapsing remitting MS will have developed secondary progressive MS.
A small number of people are diagnosed with secondary progressive MS from the outset, rather than becoming secondary progressive after having relapsing remitting MS. In hindsight, they may have experienced relapses in the past but these may have been mild or their significance was missed. Alternatively, there may have been lesions (small patches of damage caused by MS) but they were in areas of the brain or spinal cord that did not give rise to any symptoms. Some people may have been given a different diagnosis (not MS) to begin with. 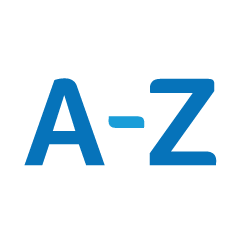 This will have been changed to a diagnosis of MS once the pattern of symptoms became clearer or because later tests were able to detect damage due to MS.
Read more on secondary progressive MS in our A to Z of MS. Between 10 and 15% of people with MS are diagnosed with primary progressive MS (or less commonly chronic progressive MS). In this type of MS disability increases from the beginning, and it is rare to have any relapses. 'Progressive' is the word used to describe the change towards more disability in MS. Although disability increases in progressive MS, the rate at which this happens varies from person to person and you may have times of improvement and times when symptoms stay the same. Some people whose MS has been progressive from onset will also experience occasional relapses. This used to be referred to as progressive relapsing MS, but would now be termed PPMS:active at the time of relapses. Read more on primary progressive MS in our A to Z of MS. In 2014, an international committee suggested revisions to the classification of multiple sclerosis types to take into account better ways of monitoring the condition. If your received a diagnosis of MS before this, you may have found your MS team using different terms to describe your MS more recently. Do ask them for clarity - it may be the terminology that has changed, not your MS. The new descriptions allow health professionals to be much clearer when describing the way your MS affects you. This includes classifying MS based on the disease activity seen in MRI scans, eg someone whose scan showed recent new areas of damage might be classed as relapsing remitting-active. Someone whose scan remained largely unchanged might be relapsing remitting-non-active. Progressive relapsing MS would be reclassified as progressive MS-active.  The committee also suggested that clinically isolated syndrome (CIS), someone's first episode of neurological symptoms, be classed as a type of MS. By noting CIS as the potential first sign of MS, people with CIS can get access to treatment and advice. Early treatment is understood to be important in reducing the impact of MS over the course of a person's lifetime. Explores the physical and emotional aspects of living with primary progressive MS and the ongoing management of the condition. Looks at how this type of MS is identified and diagnosed and at how a range of health professionals can you help manage the condition.